The publication of the Urban Mobility Strategy was, in many ways, the final piece of the jigsaw. From future mobility being framed as a “Grand Challenge” to delivering goods more sustainably as part of “the last mile”, there’s nothing left to do but act. If government is serious about fully realising the opportunities that urban mobility presents us, there can be no more strategies, no more consultations. Now is the time for genuine delivery. However, exactly what and how is up for debate. Given the sheer number of competing players now active in the market, this area has become more intractable than ever. What is clear is that bringing order to this seemingly chaotic environment will require a balanced approach to regulative, legislative and political action. Key to realising urban mobility’s potential is to look to the future, working backwards from a desired endpoint. What needs to happen with X to get to Y? Below are some of the key trends influencing urban mobility, each with a desired end point and some thoughts on how we might get there. From X to Y, but how? What was once a dominant behaviour or aspiration, owning a car is increasingly no longer considered necessary by a growing section of society. Though it has brought substantial benefits to society, high levels of ownership have also brought serious challenges. Take safety, for example. Human error was involved in 85 per cent of all road accidents in 2017. Air pollution, though having improved since 2010, remains a serious risk to public health. Congestion too. The time lost as a result costs the UK economy around £2 billion per year. Vehicle usership is a key principle upon which the concept of urban mobility is based. Arguably, we’re already nearing our endpoint, but there are still things that can be done to push usership over the line as the new dominant form of transport. A shift away from ownership means regardless of age or whether someone has a disability, people are able to access the same transport. However, equally, with the rise of MaaS platforms and different types of sharing models, there’s a danger these groups of people might be excluded from the new urban mobility, especially as transport information, booking and payment functions are modelled through digital platforms. With the requisite political will, fewer privately-owned cars will bring opportunities to radically redesign urban areas and the environmental benefits will be self-evident. New mobility models can reduce dependency on car ownership. However, closer integration of our infrastructure and vehicles with communication networks could lead to increased vulnerability to cyber-attacks. As new transport modes and services are introduced, it will be important to consider how they can be safely integrated into the transport system and vulnerable users can be protected. Once limited almost exclusively to cars, urban mobility in the future will be defined by a diverse range of modes, from bike sharing to autonomous transit, as well as more traditional options like rail and walking. When all these models co-exist with cars, and are connected in an urban environment, mobility options and utility can be enhanced significantly. To ensure the UK continues to foster new mobility innovations, the environment in which they would operate must be a fertile one, facilitated by a flexible and responsive regulatory system that works with cities and provides them the tools necessary to innovate. Key to this will be ensuring the regulatory review promised by government asks the right questions and involves the right parties. This was always inevitable and the only way in which the future of urban mobility can be realised. Key to getting to our endpoint here, however, is working together, not competing. Although the media and large parts of the public seem to be enthralled with the idea of driverless cars and flying taxis, the idea that these types of mobility models will replace government funded transportation misses the point entirely. Public and private transportation can complement one another. Public transit hubs, for example, could offer a steady stream of customers to new mobility service providers and, in turn, they can make public transit a more attractive door-to-door experience. However, such systems must be coordinated for efficiency purposes and to reduce congestion in cities. Cities and their respective transport agencies may need to take more control over how and where services are offered to avoid areas being overburdened with new services thus causing gridlock, and to ensure access is available to all cities and groups of people. For a truly integrated system, we need a more inclusive transport system. This should be one that adopts new mobility technologies as its default position, widening the affordability, availability, and accessibility of transport and narrowing existing transport inequalities in the process. The current regulatory and commercial barriers that have left the urban transport market fragmented must be addressed, be it as part of the regulatory review, legislation, or other means. In any case, the current environment means the barriers to entry for organisations wishing to integrate transport provision are too high and are threatening consumers with a lack of information to plan or buy integrated journeys effectively. Of course, these are only a selection of many factors shaping the urban mobility revolution. Talking about what needs to be done to get to certain endpoints for certain elements of urban mobility’s future is easy, but how we get to a final endpoint, encompassing all these factors, is the hard part. WA Communications will be hosting its “From chaos, comes order, but how? 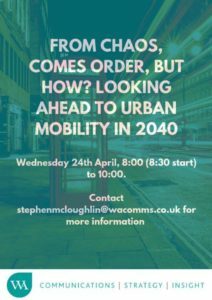 Looking ahead to urban mobility in 2040” event on Wednesday 24th April to try and answer this question. For more information about attending this event please contact Stephen McLoughlin at stephenmcloughlin@wacomms.co.uk or by calling 0203 102 3628. With experience in both in-house and consultancy roles, Alfie’s work has spanned various sectors helping to implement integrated public affairs and communications campaigns. Prior to WA Communications, Alfie worked for another public affairs agency where his clients included those from the health and social care sectors and involved providing policy briefings, research, stakeholder engagement support and strategic counsel. Before this, Alfie worked for a leading education sector trade association in their public affairs and communications team where he led on the secretariat function of an All-Party Parliamentary Group, engagement with stakeholders in Westminster and Whitehall and briefing senior management on key policy issues. Alfie has also previously undertaken placements with two MPs in both Westminster and constituency offices, as well as working on placement for the Labour Party in a regional head office in the run up to the 2015 General Election.